Along side the standard price looked up from the price table, Cab Grid Pro offers several ways to manipulate prices (e.g. Price Variations, and Discounts & Surcharges). 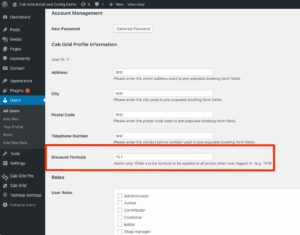 Cab Grid Pro Version 5 introduces a new feature that allows a dedicated price calculation formula to be applied for individual WordPress users, that is, users logged in to the WordPress site. Users can be registered with a WordPress website by the administrator under WordPress Admin > Users > Add New, or customers can be provided with a registration form on the site where they can register themselves. See this tutorial on providing a custom WordPress user registration form: https://www.wpbeginner.com/plugins/how-to-create-a-custom-user-registration-form-in-wordpress/. When a user is logged in, if there is a discount formula set for their account, it will be applied automatically when they calculate a taxi fare price. Assuming the user exists, access their profile via WordPress Admin > Users > All Users > [username] > Edit (on mouse-over). See screenshot above. Click the UPDATE USER button at the bottom.